The newly-discovered Kepler-90i — a sizzling hot, rocky planet that orbits its star once every 14.4 days — was found by researchers from Google and The University of Texas at Austin using machine learning. Machine learning is an approach to artificial intelligence in which computers “learn.” In this case, computers learned to identify planets by finding in Kepler data instances where the telescope recorded signals from planets beyond our solar system, known as exoplanets. Kepler-90, which is too dim to be seen with the naked eye, is a G-type star that is approximately 120% the mass and radius of the Sun. It has a surface temperature of 6080 K, and an estimated age of around 2 billion years. In comparison, the Sun is about 4.6 billion years old and has a surface temperature of 5778 K. Kepler-90 system is also similar to our Solar system: rocky planets are closer to the star while gas giants are farther away. Due to their size, The six inner planets are either super-Earths or mini-Neptunes. Two of the outer planets are gas giants. 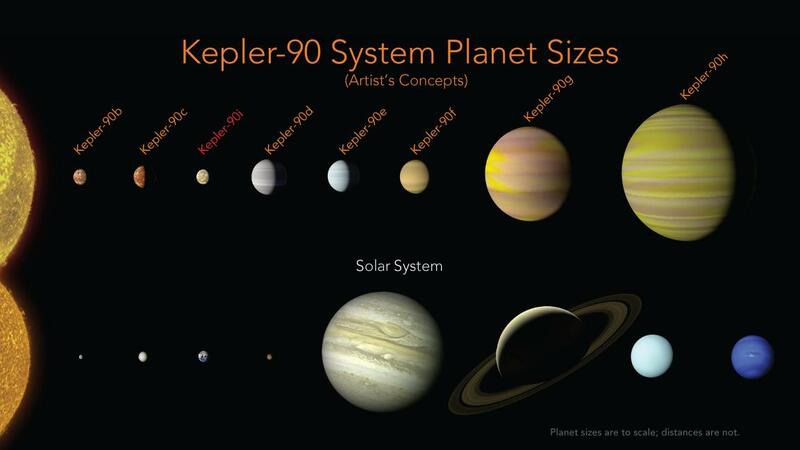 All the planets in the Kepler-90 system are closer to their star than the Earth is to the Sun. The newly-discovered Kepler-90i is about 30 percent larger than Earth, and so close to its star. Its average surface temperature is believed to exceed 800 °F (427 °C), on par with Mercury. Its outermost planet, Kepler-90h, which is a gas giant as mentioned above, orbits at a similar distance to its star as Earth does to the Sun. So, it’s highly unlikely that the Kepler-90 system harbors life. An artist’s concept of the surface of Kepler-90i (also known by its Kepler Object of Interest designation KOI-351 l), a super-Earth exoplanet with a radius 1.34 that of Earth, orbiting the early G-type main sequence star Kepler-90 every 14.45 days, discovered using Artificial Intelligence and the data collected by NASA’s Kepler Space Telescope. It has an equilibrium temperature of 709 K (436 °C; 817 °F), similar to the average temperature of Venus. Since it was launched on March 7, 2009 to discover Earth-size planets orbiting other stars, NASA’s Kepler Space Telescope collected enormous data. The “exoplanet-hunter” collect these data measuring the drop in brightness of stars as planets orbit in front of them. Until recent years, researchers were still sorting through this data by “eye” or a partially automated process. But, obviously, the weakest signals often are missed using these methods. Then, Christopher Shallue, a senior software engineer at Google Brain, and Andrew Vanderburg, researcher at Harvard Smithsonian Center for Astrophysics, thought there could be more interesting exoplanet discoveries faintly lurking in the data. Shallue and Vanderburg first used a set of 15,000 previously-vetted signals from the Kepler Space Telescope’s exoplanet database to “train” the neural network. During the phase, the artificial intelligence correctly identified true planets and false positives 96% of the time. After these initial “learning” phase, they directed their model to search for weaker signals in 670 star systems that already had multiple known planets. They assumed that these multiple-planet systems would be the best places to look for more exoplanets, because some weaker signals could be missed. And in the case of Kepler-90i, their assumption proved to be correct. Kepler-90i wasn’t the only jewel this neural network sifted out. In the Kepler-80 system, which is about 1,100 light years from the Solar System, they found a sixth planet. This one, the Earth-sized Kepler-80g, and four of its neighboring planets form what is called a resonant chain – where planets are locked by their mutual gravity in a rhythmic orbital dance. The result is an extremely stable system, similar to the seven planets in the TRAPPIST-1 system. Their research paper reporting these findings has been accepted for publication in The Astronomical Journal. Shallue and Vanderburg plan to apply their neural network to Kepler’s full set of more than 150,000 stars. More exciting discoveries probably on the way. Kepler-90 is a G-type main sequence star (The Sun is a typical example of a G-type main-sequence star) located about 2,545 light-years (780 pc) from Earth in the constellation of Draco. It is notable for having a planetary system that has an equal number of observed planets to the Solar System.